Am I the only one seeing only numbers? What's broken this time? Why isn't this getting fixed? 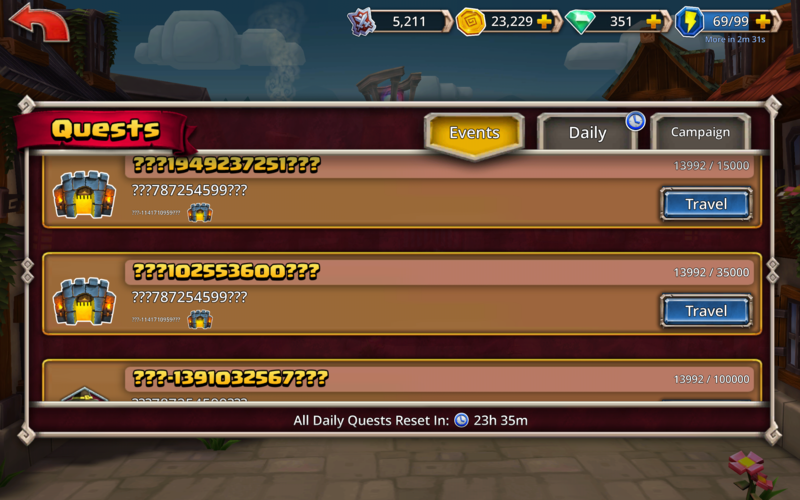 I cannot play the game if I cannot read the quests? I think that is just you. Mine is okay. @Joel Can someone look into this? Am I being hacked? it's clear the game thinks you're an AI. those quests, at least are known- collect feasts to open dungeons. ...there was another situation like yours in the forum some time ago - I forget what the issue was, but I don't recall anyone mentioning hacking. Exit the app and restart, should fix the problem. If not, uninstall then reinstall the game. Make sure you have your login info before you uninstall tho. if not, take your phone and smash it into tiny pieces, walk away and become a hermit. This type of error (like missing item/hero/rune pictures) appear if you have not enough free space on your phone when installing the latest patch (and since a few days they "patch" the game every few days). check if you have 500+ MB free on your phone, reinstalling could help, too. If you need tips to free up 500+ MB, delete this game. Hey @TurboBooster, are you still having this problem? Nothing worked, but then "Dungeon Boss just got better" happened, and the problem disappeared. And this had nothing to do with free space. I'm playing on a tablet, and there's plenty of free space here. Anyway, now it's fixed.